Joel Greene here from Condo Hotel Center. The property I have for you today is actually more than a single property. It’s a mini-city, which is why the developers chose to include the word “city” when they named it, and the condos offer a unique opportunity to live in one of the hottest spots in the country. Artécity is an upscale residential village in exciting South Beach or SoBe, as it’s often called, which is located on the southernmost tip of Miami Beach, Florida. It is made up of six buildings wrapped around beautifully landscaped areas, private gardens with fountains, and quaint courtyards. It’s in a convenient location while maintaining the seclusion and serenity that the large high-rise buildings in South Beach don’t really offer. The investment angle on this property at this early phase with condo prices starting at just $222,000 is affordability, particularly when compared to the beachfront buildings within a two-minute walk of Artécity. Artécity is an upscale residential village in exciting South Beach. If you’ve ever been to South Beach or even seen photos of it, then you know it’s the definition of Art Deco. It’s a whimsical collection of more than 800 architecturally protected buildings from the 1930s and 40s that has been transformed into a super chic destination of celebrities and an urban neighborhood of eccentric residents. The Governor Hotel – Originally built in 1939 by famed Art Deco architect Henry Hohauser, it has been renovated completely back to its original splendor with the luxuries of the 21st century added. Rooms were combined to create larger one-bedroom and suite offerings. The mosaic fountain in the courtyard has been revived and serves as the focal point for the central courtyard. It has a total of 61 condos and some retail space as well. 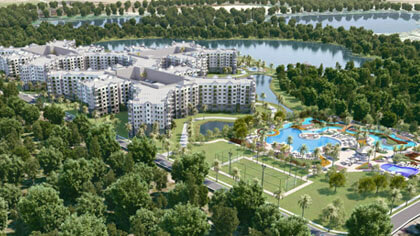 Artepark North and South – New construction, these two buildings, one with five stories and the other with six, offer views of the park, the Atlantic Ocean and the Miami Beach Golf Course. They include penthouses with private terraces, two-story townhouses and one- to three-bedroom condos with 11-foot ceilings heights, all with parking. Park Villas East and West – The rebuilt Park Apartment Complex is comprised of villas and two-story townhomes surrounded by fountains and tropical landscaping. Park Plaza Corner – 10 junior suites plus retail space, not available yet. Construction on Artécity began in 2007 and is being completed in 2011. The property was developed by Italian developer, Claudio Benedetti of Bologna, Italy, who filed for Chapter 11 bankruptcy protection in July 2010 before completing construction. ST Residential, an opportunity fund that manages a $4.5 billion distressed real estate loan portfolio for the FDIC, obtained the Artécity construction loan in January 2010 as part of its acquisition of the loan portfolio of the failed Corus Bank from the FDIC. After a year-long bankruptcy process, an auction was held on June 29, 2011, which resulted in ST Residential acquiring ownership of 159 developer condo units. They took title to the units in July 2011, and just this month began selling them, so you are getting in when prices are at their lowest. The architect for Artécity is Arquitectonica, the internationally renowned, Miami-based firm. Founded in 1977, its work includes mixed-use developments, resorts, hotels, luxury condominiums, schools, universities and museums. 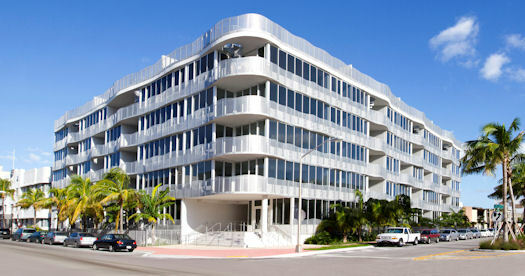 Artécity is located in the cultural district of South Beach, the ultimate destination in South Florida. It’s an up-and-coming area that’s a virtual oasis free of noise and traffic. 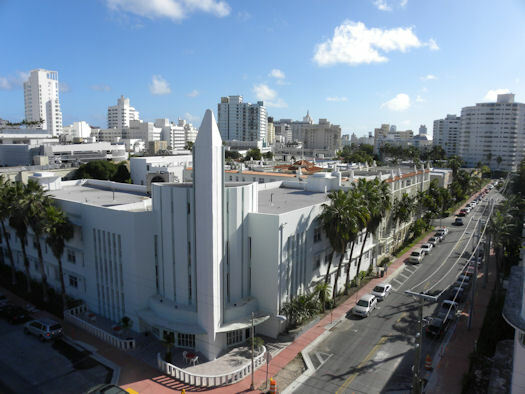 Specifically, it is near the Miami Beach Convention Center, the Bass Museum, the Jackie Gleason Theater of the Performing Arts, the Miami City Ballet, New World Symphony, and the Fillmore Theatre. Is it any wonder why they named the development Artécity? It is also located within walking distance of the ocean, the newly renovated Bayshore Golf Course, shopping and dining at Lincoln Road and the renowned Miami Beach nightlife. 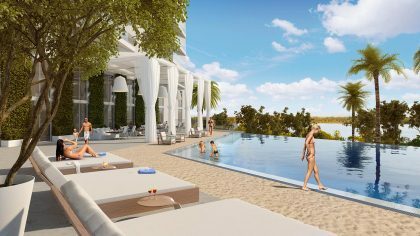 If you’ve dreamed of having a luxurious Miami Beach condo that is near to all the action, but don’t want to pay those expensive oceanfront condo prices, this development might be the perfect solution. The condos of Artécity are delivered decorator-ready with private, oversized balconies. The contemporary Italian bathrooms have floating glass showers. The custom-designed Italian kitchens feature stainless steel Bosch appliances, tempered glass counter tops and back splashes, and Mate-lacquered cabinetry. The residences range in size from 556 square feet to 2,000 square feet. Prices start at $222,000 and go up to $1,500,000. Closings at Artécity can take place within 30 days. Want more information? Check out my data sheet with all the details. You’ll just need to provide your name and contact information as required by the developer. Request the ArtÃ©city data sheet here. The Artécity development is so unique, it really must be seen to be appreciated. I’d love to give you a tour and also show you around South Beach. Just let me know when you’re going to be in town. If you’d like to see what else we have available throughout Florida and the world, please check out our Featured Properties. 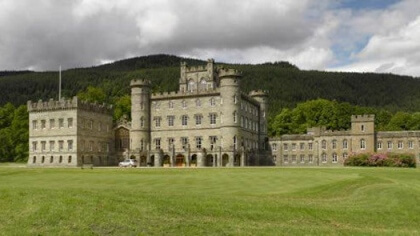 As always, thanks for your interest in the properties we showcase. Wishing you a sunny day.